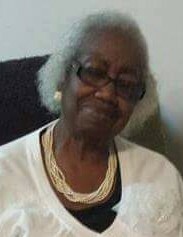 Helen Derothea Falls Holmes (Big Momma) departed this life on Monday, November 12, 2018. Helen was born September 13, 1932 to the late Robert R. Falls and Clarrenner Adams Falls in Cramerton, NC. She is a 1948 graduate of Reid High School in Belmont, NC. She retired from Presbyterian Hospital in 1994. She was married to the late Deacon Johnnie Holmes, Jr. for 66 years and to their union were born six, two of which died at birth. In addition to her parents and husband, she is also proceeded in death by her brothers, Alonzo Falls, William Falls, and Timothy (T.C.) Falls; and sisters, Rebecca Falls and Lucinda White. Helen was a life-long member of Center Baptist Church – she served as a former usher, former Sunday School teacher and various other organizations and activities. She was active until her passing as a member of the Sunday School member, deaconess, hymn choir, and senior missionaries. She leaves to cherish her memories one son, Robert Holmes (Jean) and three daughters Paulette H. Williams (Kenneth), Veronica H. McElhaney (Otis), and Nedra H. Lodge (Talmadge); two nephews that she helped raised Fred L. Glenn (Ernestine) and William L. Glenn; and one niece, Louise Crawford. Eight grandchildren, April H. McGlenn, Camille H. Harrington (Russell), Michael Holmes (Shaniqua), Quentin Williams (Telithea), Dedric Williams, Rodney McElhaney (Tonya), Xzavier Holmes, and Jaron McElhaney; 25 great-grandchildren, and seven great-great grandchildren; sisters-in-law, brothers-in-law, a host great nieces and nephews and other family and friends.